Rechargeable LED Alert Flare Beacon is an essential piece of equipment for police, firefighters, EMTs, rescue services, first responders, members of emergency response teams and the general public. When you need to alert others to a road hazard or are in need of light even during a heavy rain, the Rechargeable LED Flare Alert Beacon is a beacon that gets noticed. 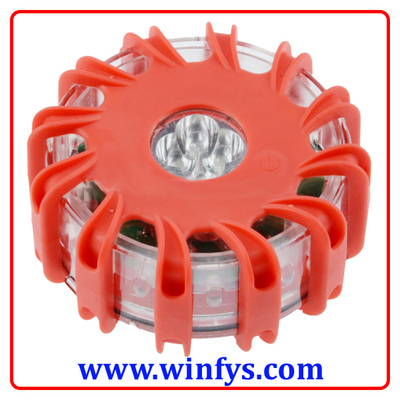 Because it is durable, functional in any weather condition, compliant with traffic and safety regulations, magnetic, and submersible to 50 feet, this red flashing light (also available in yellow/amber) has a million and one uses. The Rechargeable LED Alert Flare Beacon has 9 different flashing patterns, with the 16 bright LEDs capable of being seen up to 1/2 mile. Choose from rotate, single blink, alternating blinks, quad flash, high steady light, low steady light, 2 LED flashlight, 4 LED flashlight, and S. O. S. Rescue Morse Code. Now that"s a safety flare that means business.